If there is one thing I miss about Minnesota, and I think I say this every year, it’s fall and winter. Down here in San Antonio, it stays hot until nearly Thanksgiving, and there aren’t pretty colorful leaves, boots, scarves, or hoodies to wear. Unless you like sweating just to follow trend. No thanks. I’ll be breaking out my boots and skinny jeans in like…January. Wah. But, just because it’s hot and gross outside, doesn’t mean I can’t get my fall on inside. Woo! 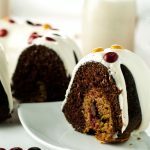 You guys already know that I am a big fan of bundt cakes, like my Mini Red Velvet Bundt Cakes and my Peach Mango Bundt Cake, which is why I am bring you this Chocolate Cookie Dough Bundt Cake today! Bringing you a taste of fall, so you can be ready for fall. I’m pro-planning, which never happens, but this time it did. You can thank me whenever. I can wait. 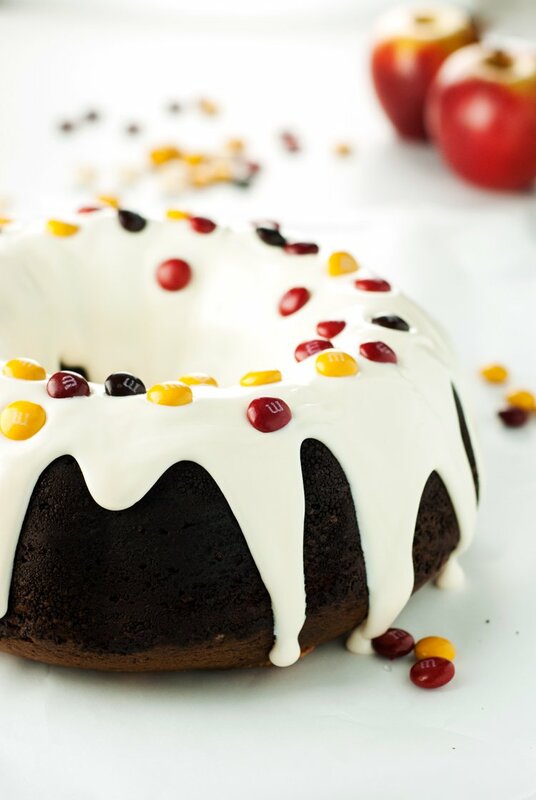 The fun thing about this cake is the surprise inside cookie dough, studded with M&M’s® Milk Chocolate Harvest candies, and topped with some decadent Pillsbury™ Creamy Supreme® Cream Cheese icing! This thing is perfect for game day because it slices up into a ton of shareable pieces, and everyone just goes crazy for the flavor and fun of it. I whipped up a batch of my favorite chocolate chip cookies, but swapped out the chocolate chips for the M&M’s®, and I used about 1/4 of the dough for this cake, so I have a nice pile of cookie dough in the fridge waiting to be baked up another day. That’s a double plus bonus, I think! I rolled the dough into little balls and plopped them into the cake batter, leaving them just kind of sticking out, because as the cake bakes, the batter will rise around it. I gently melted the icing as well, so I could just pour it over the cake like a dream. I give thanks to Sweet C’s Designs for that trick, though I used an improvised double boiler technique instead, as I do not own a microwave. Just look at that icing. Delish. Omnomnom. 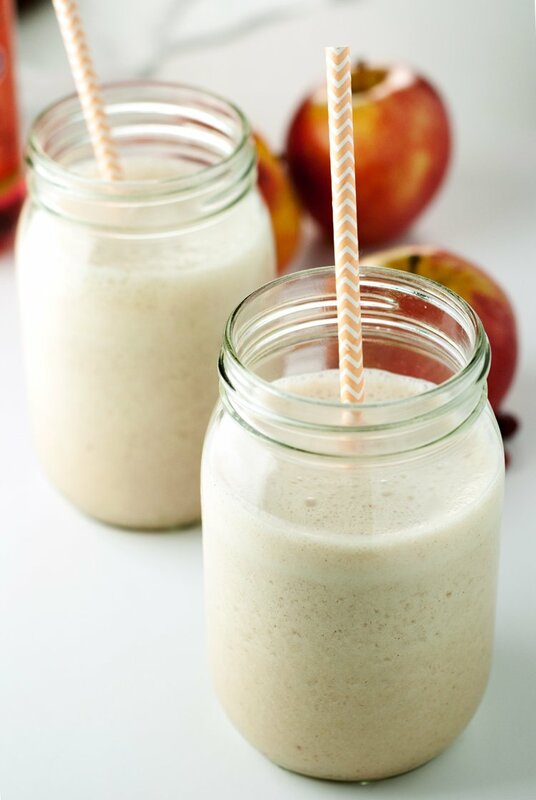 And since we are in the fall spirit, why not whip up some Apple Pie Smoothies as well? I broke out some Mott’s® Apple Juice and Snapple® Apple to make some smoothies and they were amazing! The Snapple® one was slightly sweeter than the Mott’s® version, so I adjusted the sugar accordingly. Basically, I put 1 1/2 cups of apple juice in a blender with a cup of vanilla greek yogurt, 1/2 of a frozen banana, as well as a dash of cinnamon, sprinkle of cardamom, and a pinch of sugar. Blend it all together and you have delicious in a glass. Diiiiid you know that there is a brand new M&M’s® flavor?? You NEED to check it out, because it’s Pecan Pie! Head out to your local Walmart to pick up a bag, as well as all the other ingredients to make this cake and smoothie, and get your fall on! Make sure you grab the coupon for $1.00 off TWO (2) M&M’s® Chocolate Candies, 9.4oz or larger, available at Walmart! Prepare chocolate chip cookies as directed in the original recipe, swapping out the chocolate chips for the 1 cup of M&M'sÂ®. Reserve 1/4 of the dough, and wrap the rest in plastic and place in the fridge for later use. Preheat oven to 325 degrees. 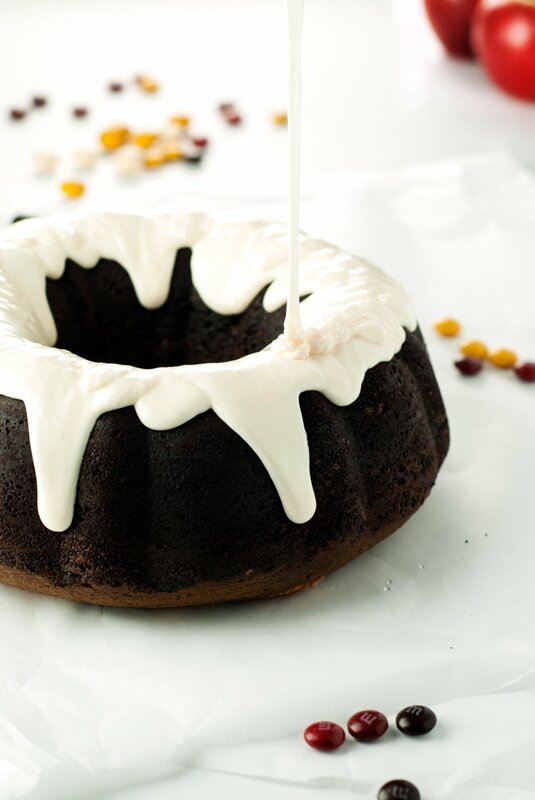 Grease a bundt pan with shortening or butter, then coat in an even layer of cocoa powder. Tap out the excess and set aside. In a large mixing bowl beat the butter and sugar until light and fluffy, around 5 minutes. Beat in the eggs, one at time, until fully incorporated, then mix in the cocoa powder, vanilla extract, and sour cream. Whisk together the flour, baking soda, and salt and slowly add to the mixture. Gently beat in the boiling water on low speed. ** Pour the batter into the prepared bundt pan. 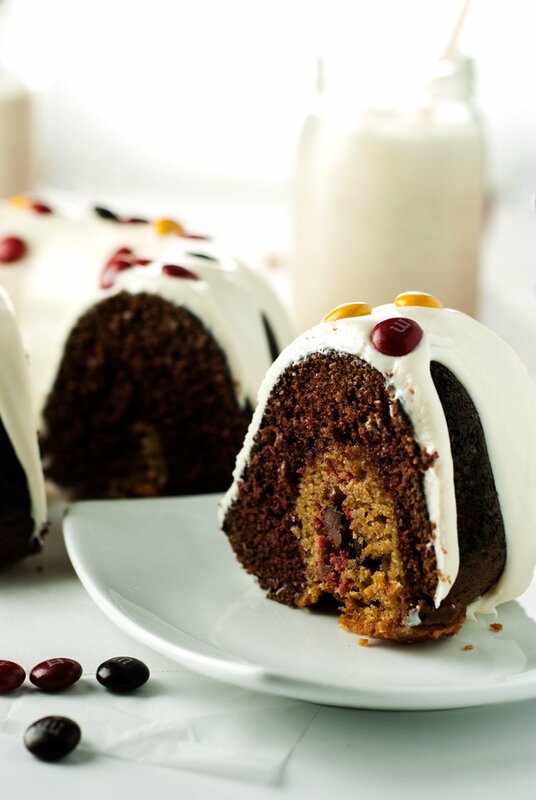 Roll the cookie dough into small balls and plop them into the cake batter in the bundt cake, pressing down just slightly. Bake for 60 minutes, or until a toothpick inserted into the center of the cake comes out clean. Remove the lid and foil from the icing, then place in the microwave and heat for 15 second intervals until smooth and pourable. 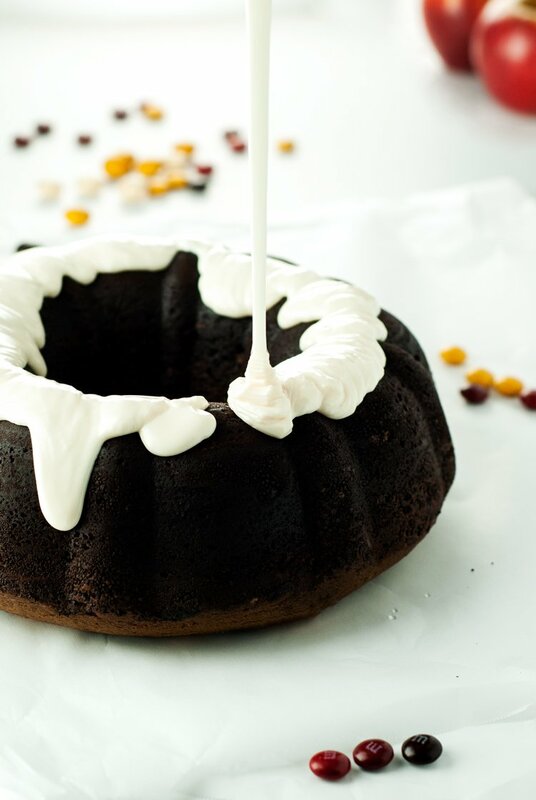 Slowly pour over cooled bundt cake, allow to set, then cut up and serve! 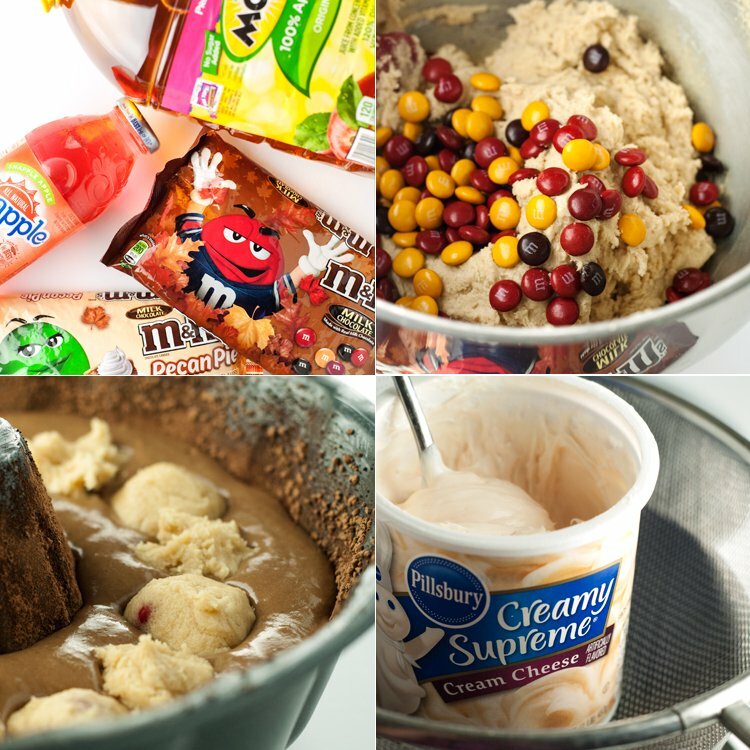 * Omit the chocolate chips and use the M&M'sÂ® instead. Cover and refrigerate the remaining cookie dough for later use. ** Batter will be slightly runny, with a consistency more like mousse. WHAT! There are Pecan Pie M&M's?!?!?! I just died.....I'm dead. Dead. PS: I NEED YOUR SHIRT!!! #Hangry. LMAO!